Join City Club of Denver in welcoming Honorable Mayor Michael B. Hancock in his traditional address to the club. Michael Hancock was born in Fort Hood, Texas, the youngest of 10 children from an Army family that moved to Denver when he was just 10 months old. 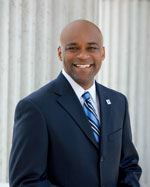 A graduate of Denver’s Manual High School, Hancock attended Hastings College in Nebraska, working summers in Denver as an intern for then-Mayor Federico Peña’s office before graduating in 1991 with a B.A. in political science and minor in communications. He earned a master’s degree in public administration from the University of Colorado-Denver in 1995. Hancock started his career while pursuing his master’s degree, working at both the Denver Housing Authority and National Civic League, where he designed, implemented and oversaw the first-ever athletic, cultural and leadership-training programs in public housing and helped groups all over the country craft and enact strategic plans to solve economic and budget challenges, increase civic participation and improve governance. He joined Metro Denver’s Urban League affiliate in 1995 as program director before becoming president in 1999, becoming the youngest President of an Urban League chapter in America. At the Urban League, Hancock created a nationally recognized and award winning job-training program and developed long lasting private-sector partnerships. In 2003, Hancock was elected to represent Denver City Council’s District 11. He served two terms as council president, from 2006-08. He presided over the creation of the Denver Preschool Program; spearheaded efforts to expand economic opportunities; fought to end the foreclosure crisis and mortgage fraud; helped initiate innovative-schools legislation and helped guide the Better Denver Bond program. Mayor Hancock is the proud father of three children, Alayna, Jordan and Janae, and he and his wife, Mary, have been married for 20 years after first meeting in middle school.